Leadoff hitter Fox Semones (James Madison) scored three runs in the win over Loudoun. 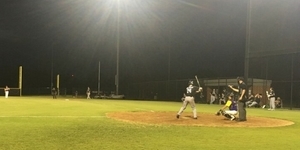 On a beautiful evening for baseball at Rock Ridge High School in Ashburn, Virginia, Big Train (3-0) cruised to a 17-2 win over the Loudoun Riverdogs (0-2) to extend its perfect start to the 2018 season. Starting pitcher Carlos Lomeli (St. Mary’s College) enjoyed a successful Big Train debut, tossing five scoreless innings and allowing just one hit. “Carlos was outstanding,” Big Train manager Sal Colangelo said. “He threw three pitches for a strike, and mixed well, and hit his spots when needed.” Colangelo also noted that due to the team’s depth at pitcher this season, there was no reason to have Lomeli pitch more than five innings despite his success. Bethesda got its offense going early in the contest, as rightfelder Jacob Westerman (University of San Francisco) drove in short stop Fox Semones (James Madison) in the top of the first to open the scoring. Semones picked up an RBI of his own an inning later when he drove in second baseman Tyler Reis (Waynesburg) to extend the lead to 2-0. The theme of getting on base was never truer than in the late innings, when 10 Bethesda runs crossed the plate, all on non-hit plays. After loading the bases in the sixth, Big Train manufactured three runs via a hit batter, a walk and a fielder’s choice to go up 10-0. Jamarian Crane provided Loudoun’s first run with a solo homer in the sixth, but Bethesda added another three runs in the seventh with no hits in the inning. Bethesda put its leadoff man on base in seven innings on the night, and went on to score each time. The team has now scored double-digit runs in each of its three games this season. Big Train will be on the road again on Friday as they visit the Alexandria Aces at 6:30 p.m. at Frank Mann Field.